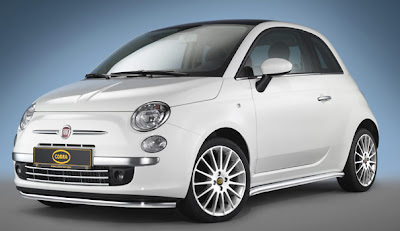 Stainless steel that sparkles like chrome, custom-tailored light-alloy wheels with the corresponding ride-height lowering and a sonorous exhaust note: Cobra Technology & Lifestyle now also adds some pizzazz to the new Fiat 500. Cobra Technology & Lifestyle gives the modern incarnation of this most classic of Italian cars a truly sparkling appearance: The face of the Cinquecento (Italian for 500) is refined with two high-gloss stainless-steel components. rocker panels from damage. The rear apron can be refined with the Cobra Technology & Lifestyle rear guard that follows the lower contours of the rear bumper. The striking stainless-steel tubular guard has a diameter of 42 millimeters and offers the added benefit of protecting the rear from minor parking damage.